Canada is experiencing an especially frigid winter, with temperatures feeling as low as -40° C even in southern parts of the country like Toronto. Many people will ride out this cold snap in the comfort of their homes, or bundle up if they must face the frosty outdoors. Environment Canada issues extreme cold weather alerts to protect people from frostbite, cities open up warming centres for homeless individuals, and schools even cancel outdoor recess periods when the temperature plummets. But for the millions of chickens, pigs, and cows trucked to slaughterhouses everyday in Canada, it’s business as usual—even in frigid extremes. Animals are routinely transported to slaughter in open-sided vehicles, with no heating systems to protect them from the dangerous cold. 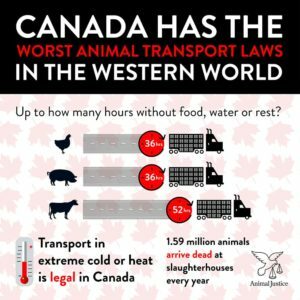 Canada’s animal transport laws are among the weakest in the western world, and there are no restrictions that lay out minimum or maximum temperatures in which animals can be transported. In brutally cold weather, animals routinely arrive at slaughter frostbitten or even dead from weather exposure. Workers at Canada’s largest slaughterhouse, Maple Lodge Farms, which kills half a million chickens every day, have described chickens arriving to slaughter, frozen solid like “hockey pucks” and “popsicles”. Government statistics show at least 1.59 million animals arriving dead at slaughterhouses every year. Canada’s outdated transport laws haven’t been revised since the 1970s, and a recent proposal by the federal government to update the rules still fails to restrict animal transport during extreme weather, or require climate control for trucks. Existing transport laws are ineffectively enforced by the Canadian Food Inspection Agency, and even when investigations and prosecutions do take place, penalties are not strong enough to motivate industry to protect animals from the cold. Maple Lodge Farms, for example, has been repeatedly convicted and fined for allowing animals to freeze to death, yet still operates using the same inadequate trucks. In 2018, Animal Justice will continue to fight archaic transport laws, and to protect millions of animals from the extreme suffering they endure on Canadian farms. To help, please sign up to our mailing list and stay tuned for ways to get involved.